SO-CALLED castle-top boxes represent a fascinating moment in British social history. 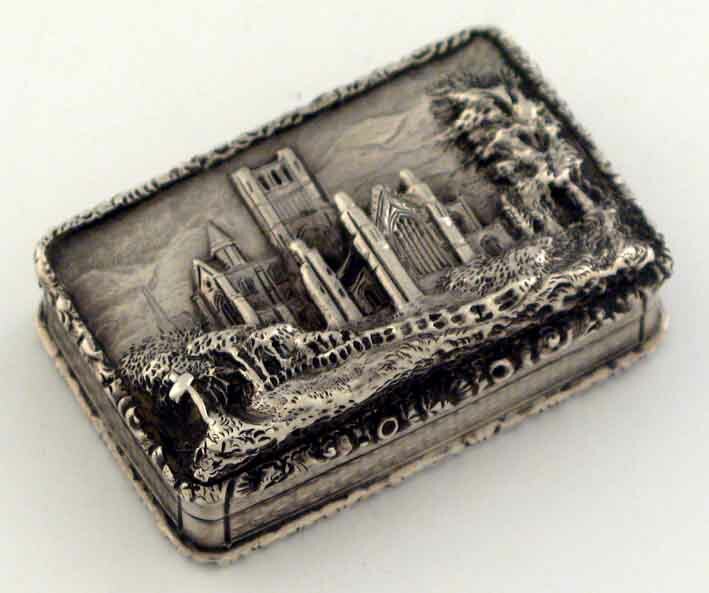 Fashioned by the silver ‘toy’ makers of Birmingham, these vinaigrettes and card cases engraved or die-stamped with British landmarks were seemingly marketed as tourist souvenirs. They sold to the honeymooners and day-trippers who travelled the country for the first time in the mid 19th century. It was a relatively brief flowering. 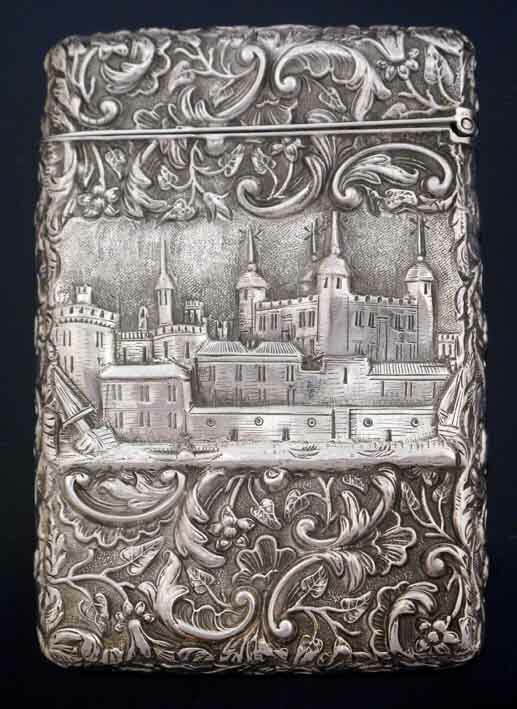 While the important social custom of leaving visiting cards spanned the 19th century - and the need to mask outside aromas with something more pleasant much longer - the fashion for topographical souvenirs in silver was primarily confined to the period c.1830-1860. But when these mementos fell from grace, they at least left behind a perfect collecting field for future generations. Castle-tops remain among the strongest areas of the lively small silver market. A relatively large number of collectors ensure a solid demand and if good examples are not easy to come by, then the supply side of the equation was given a boost by three substantial offerings in the country in the space of six weeks. There were more than 50 examples offered as part of the £236,000 George Petzall collection at Salisbury's Woolley & Wallis (19.5% buyer's premium) on October 28; a West Sussex collection of 31 boxes was sold by Duke's (19.5% buyer's premium) of Dorchester on November 27 and a smaller but worthwhile offering appeared at Lyon & Turnbull (25% buyer's premium) in Edinburgh on December 2. The latter were part of a Midlands consignment from a descendent of the Silburn family, BADA dealers in Ipswich from the 1920s to the 1970s (see ATG No 1862, October 25). The primary attraction of castle-tops lies in the sheer variety of the landmarks they depict and the ways in which they are depicted. Quality and condition count but, generally speaking, the scarcer the view the better the price. One recalls the card case depicting the Bevis Marks Synagogue seen at Dreweatt Neate of Donnington Priory back in July 2005. Built in London by Joseph Avis, a Quaker, for the Sephardic Jews and opened in 1701, Bevis Marks is the oldest synagogue still in use in Britain. When Nathaniel Mills, the most prolific and best-known of the Birmingham boxmakers, made a card case depicting an exterior view of the building in 1845 it was perhaps as a special commission rather than a commercial line. It sold at £8000, an auction high for a castle-top box. There was nothing to match this across the recent sales (and typically the rarest castle-top vinagrettes retail some distance below this record sum), but the representative sample pictured on the facing page includes a number of rarities. Petworth dealer Nicholas Shaw, a specialist in castle-tops who bought in both Wiltshire and Dorset sales, believes there are in excess of 200 different castle views out there. He points out that, while some destinations were clearly very popular at the time - Windsor Castle, Warwick Castle, Newstead Abbey (the family home of Byron) and Sir Walter Scott's home Abbotsford among them - collectors are wise to scarce depictions of these relatively common subjects. The East Terrace of Windsor Castle is such a view. 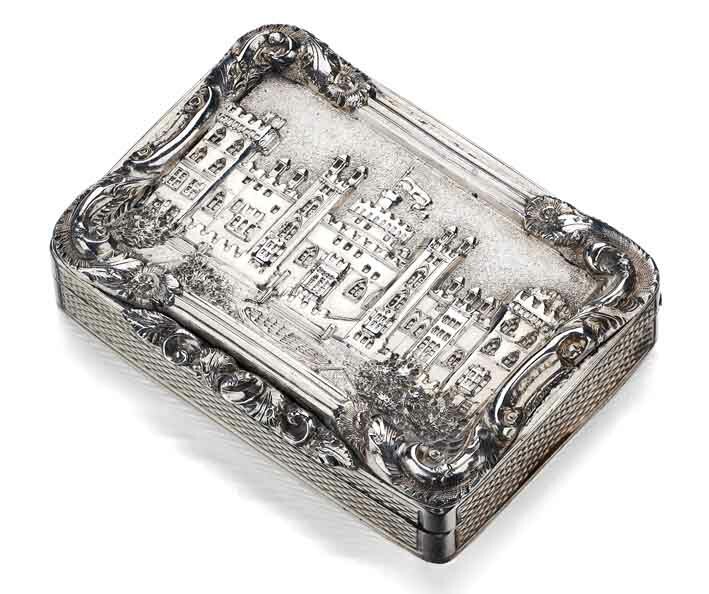 Seen on a vinaigrette with unusual border decoration by George Willmore at Lyon & Turnbull, it sold to a London dealer at £2800 (estimate £350- 500) - twice what one might pay for an example with a more typical view of Windsor from the Thames. 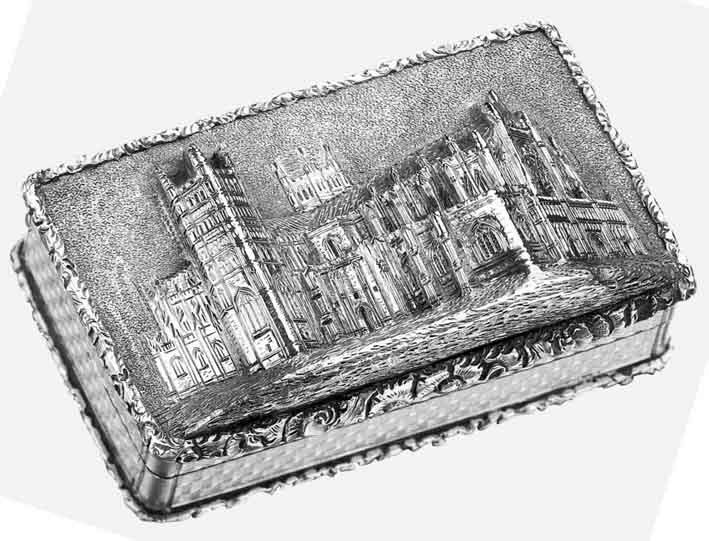 Likewise, the particular view of Westminster Abbey seen in high relief on a vinaigrette in this sale was evidently a rarity. Five telephone bidders and strong interest from the internet saw it take £4400 from an Australian collector. While most castle-top card cases have a central cartouche for an owner's initial to the reverse, the few that are double-sided carry a premium. An example by Yapp and Woodward, 1850, with views of the Tower of London and Windsor Castle took £2600 in Salisbury. Former dealer George Petzall owned three boxes by Mills depicting the relatively scarce Melrose Abbey and a vinaigrette of 1844 took £3600. 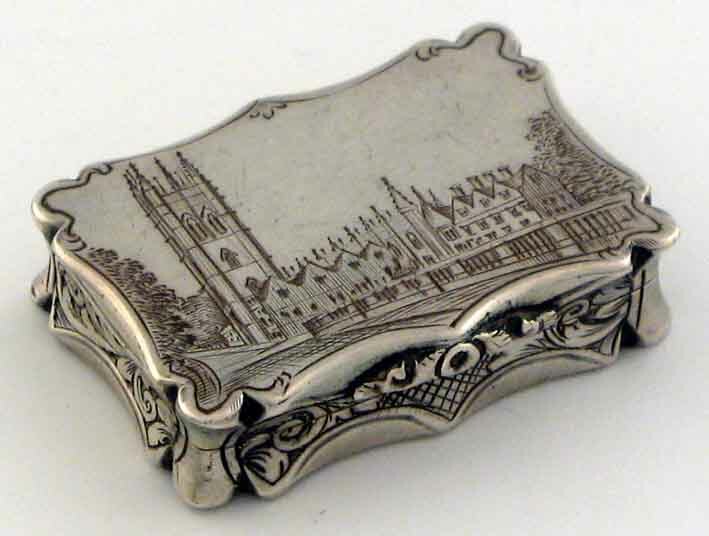 Equally well-received were boxes depicting Oxford colleges: a vinaigrette at Duke's with a view of St John's sold at £3600, while £3800 was paid at W&W for a vinaigrette engraved with a view of Magdalene College. With subject matter so important - and identification not always so easy - research does pay. When embarking upon their collecting odyssey the West Sussex vendors at Duke's sale set about writing to a huge number of stately homes, castles, cathedrals and country houses requesting postcards to aid identification. 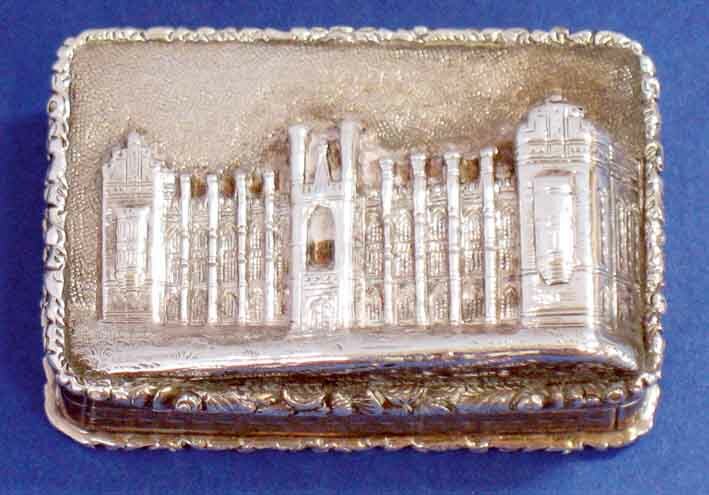 Doubtless this research helped in the cataloguing of two scarce Liverpudlian scenes: a Mills vinaigrette with Liverpool Collegiate High School and a card case by Frederick Marston, 1849, with a view of St George's Hall, Liverpool. Both sold well at £3200 and £2400 respectively. Specialists always enjoy the occasions when they spot a rare scene unidentified (or, better still, incorrectly identified) in an auction catalogue. Two unidentified Mills vinaigrettes in the Petzall collection presented possibilities for research: one was engraved with a riverscape and buildings, the other with a large monolithic building similar - but perhaps not similar enough - to Cliveden. Both sold at multi-estimate sums of £2600 apiece.